ROCKAWAY BEACH — From her front porch, Nancy Webster has a clear view of the hills just east of the coast highway, a western hemlock forest that’s home to Rockaway Beach‘s water supply. The retired social worker, who grew up in a Northwest logging family, worried when she saw patchwork clear-cuts expanding in 2011. Last summer, she and a friend hiked into the watershed during a storm and saw the creek that feeds Rockaway Beach’s water treatment plant “running chocolate brown.” In September, she spotted helicopters spraying herbicides, catching distinct whiffs at her house a half-mile away. Just like that, the latest highly motivated critic of Oregon’s Forest Practices Act, which governs private timberlands, was born. “You can just see the mud washing off the slopes, and then a 20-foot buffer on logging along the creek,” Webster says. “It just seems like there is very little protection for the watershed.”Timberlands are easier on water quality than cities and farms. The timeline between harvests runs for decades, and herbicides typically get sprayed only in the first years after a cut, until new trees are established. But when it comes to stream buffers and herbicide applications, Oregon’s rules for private forests are less stringent than in neighboring Washington and far less stringent than in national forests. After years of complaints, the U.S. Environmental Protection Agency is studying whether Oregon’s regulation of nonindustrial sources of water pollution, including timberlands, is good enough. Oregon’s Forest Practices Act was the first in the nation to regulate private lands when the state adopted it in 1971. But disputes over it have bubbled up around the state. In southwest Oregon, much of the congressional delegation favors applying the more lenient rules on 1.5 million acres of federal forests, raising concerns about the effects on rivers and drinking water. Residents of Triangle Lake, west of Eugene, complain of drift from spraying on private timberland — and point to herbicides found in their urine. And the EPA and others question the effects on streams and salmon listed under the Endangered Species Act. Along the coast, drinking water is a top concern. Tom Merrell, manager of the Arch Cape Service District, says Oregon’s no-cut zone of 20 feet along significant streams doesn’t protect drinking water from herbicides and mud runoff, or “turbidity.” Washington’s no-cut zone is 50 feet. Turbidity adds to filtering costs and can boost harmful byproducts that arise when chlorine, a disinfectant added to kill bacteria, hits organic matter bunched in the water. On Oregon’s north coast, 11 of the 18 public water systems fed by rivers or creeks have received alerts over the years for high levels of disinfection byproducts — trihalomethanes and haloacetic acids. 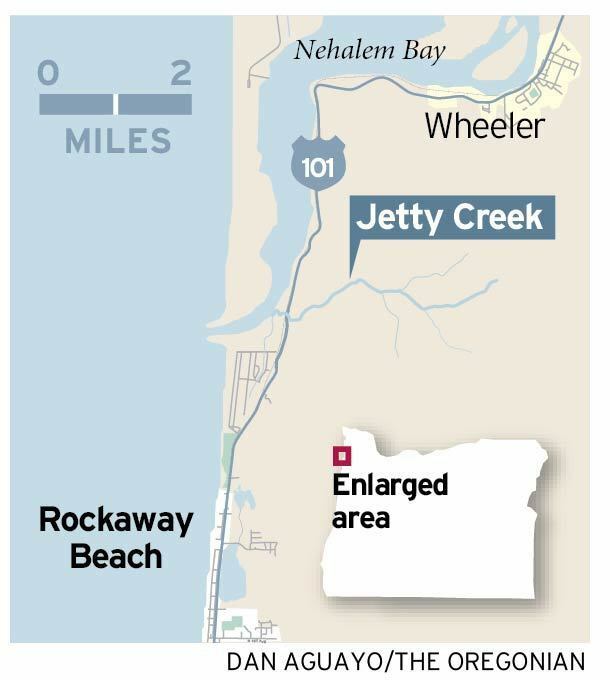 The watershed that feeds Rockaway Beach runs 1,200 acres, with Jetty Creek the main conduit. On a steep hike along forest roads with Webster and other members of Rockaway Citizens for Watershed Protection, the part of the creek closest to U.S. 101 and the water plant is heavily forested and shaded.Within a mile, clear-cuts emerge, scrabbly ground bumping into strips of trees along the creek. The citizen group’s analysis of Google satellite photos and harvest notices show that about fourth-fifths of the watershed was clear-cut since 2004, the majority since 2010. As a drinking water stream, Jetty Creek gets some protection. But Oregon’s smaller, non-fish-bearing streams — which can be 80 percent of a watershed — get no buffer from cuts or spraying under the law. Washington, by contrast, extends its 50-foot, no-touch buffer to at least half of its small-stream network. Stream buffers for aerial herbicide spraying are also smaller in Oregon than in Washington. And Oregon’s notification system is solely on paper and costly, with windows for potential sprays as long as six months. The hikers pass tributary creeks still trickling in late July, with trees cut to the edge. Judy Coleman, Webster’s friend, compares it with the Portland-owned Bull Run watershed near Mount Hood, where logging has been prohibited since 1996. “If this happened in the Bull Run, there would be an uproar,” says Coleman, a former water quality analyst for Oregon’s Department of Environmental Quality. 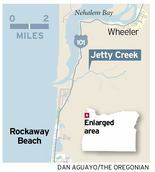 Ideally, she and Webster say, Rockaway Beach would buy this land, or at least an easement along streams. Another potential solution: Swap land with federal agencies, which use relatively little herbicide and have buffers of 150 feet on small streams, with only thinning allowed. Since January 2011, Rockaway Beach officials have warned residents eight times about excess disinfection byproducts after quarterly testing. The byproducts can diminish liver, kidney and nervous system function, and increase the risk of bladder cancer, health officials say. The district, which supplies 2,300 water hookups, spent $600,000 on a membrane filter two years ago for its new treatment plant, but that didn’t solve the problem. Now it’s spending $120,000 for an upstream sand filter to try to capture more silt. A 2002 evaluation identified clear-cuts as a potential source of contamination. But Luke Shepard, Rockaway Beach’s public works director, says it’s not certain that logging is to blame. Treatments have changed, he says, and supplementing with well water has stopped, expanding reliance on Jetty Creek. He shuts down the plant for 24 hours when turbidity runs high or after timber companies tell him an herbicide spray is coming. At this point, it’s unclear if logging contributes to the byproducts, says Kari Salis, a manager for the Oregon Health Authority’s drinking water program. DEQ studies of coastal drinking water watersheds have pinpointed turbidity as a concern, but haven’t determined what causes it. This fall, the agency will monitor Jetty Creek to try to catch potential impacts from herbicide spraying. Statewide, tests of treated drinking water rarely find herbicides. Washington’s streamside protection rules are “considerably stronger,” DEQ officials say. Generally, studies show that clear-cuts increase water flow, powering streams to erode bank sediment or stir up streambeds, says Joshua Seeds, a DEQ drinking water program specialist. But the connection isn’t specific enough to ask forestry officials to tighten rules. The two timberland owners in the Rockaway Beach watershed — Stimson Lumber and Olympic Resource Management — say they often exceed state requirements.Scott Gray, Stimson’s western resources manager, said company officials put more than minimum buffers along drinking water streams and work with local water managers to address concerns. “We take our land stewardship responsibilities very seriously,” Gray said in an email. Tim Raschko, Olympic’s director of timberland management, said the company cut 500 acres from 2010 to 2012, and spent $357,000 on logging road maintenance in 2011, four times the industry average per acre. Runoff from roads is considered a prime source of sediment in streams long term, particularly during log hauling. Raschko said workers set up silt fences and sediment traps and monitored the creek for sediment. The company notifies neighbors within 1,000 feet of spraying of herbicides, Raschko says, and tries to post more precise spraying dates, neither required under Oregon law. It also skipped herbicides in the clear-cut closest to the water plant, he says. Raschko says he can’t answer whether Oregon’s forest rules — set by compromise as much as science — are adequate. “But there’s science going on and we need to get answers on that quickly, so if things are inadequate, we can adjust,” he says. The state Forestry Department is working with timber companies, university experts and other agencies on three studies to better gauge the effects of logging on streams. The first report, on Hinkle Creek near Roseburg, found significantly more sediment from logging. A Coast Range study along the Trask River should show whether greater protection of headwaters would benefit water quality. Lena Tucker, deputy chief of the department’s private forests division, says the state has adjusted rules often over the years, and will again if science supports it. After studies indicated runoff problems from log hauling during storms, for example, the state restricted it. The state also plans online notification of pesticide spraying by late 2014, replacing cumbersome paperwork. The Oregon agency also bears in mind that forests generate better water quality than subdivisions or other uses, she says.